The youth wing of the party, Young Alternative, was formed in June of 2013. Individuals between the ages of 14 and 35 can join the party and become members of the youth branch, but not members of the party. According to their own records, in July 2016 Young Alternative already counted around 900 members. The federal leadership of Young Alternative is made up of 12 people, two of whom are the chairmen. Co-chairmanship became political fashion in Germany largely on the initiative of the Greens, but beyond this any similarity between the Greens and Young Alternative ends. The leadership does not feature a single woman. Following their “senior comrades,” Young Alternative opposes Turkey joining the EU, as the country “politically and, above all, ideologically, does not relate to Europe” and “does not share our European values.” Turkey is blamed for discriminating against Christians on its own territory, Erdogan’s anti-American and anti-Israeli rhetoric in relation to the conflict in Gaza, and especially for financing Islamist activity on German territory, in particular the construction of a large number of mosques. “The Turkish government exercises constant and comprehensive influence over Turks living in Germany, which impedes their integration and promotes the formation of parallel communities.” A significant part of their program is dedicated to calls to limit immigration and stop the Islamization of Germany. In the immigration sphere, it is proposed that the Australian experience be adopted and bar, for example, African refugees from entering Europe, instead organizing camps for them directly in Africa. Young Alternative has very radically spoken out against certain elements of the Islamic tradition’s female clothing, the right to wear which is a heated debate in German society. They demand that Germany ban the public wearing of burqas and prohibit persons employed in the public service from wearing hijabs. In the first case, the ban is not meant to relate to personal life, and in the second, it is meant to be in force exclusively in the work place. AfD’s membership has continued to grow. If in October 2014, its ranks were made up of 19,885 people , then in May 2016, it was already 23,400. According to surveys conducted by six rating agencies, in spring 2016, the level of AfD’s support among voters peaked and ranged from 12% to 15%. Moreover, Alternative for Germany has not only surpassed that of the Free Democratic Party, but also the Left and has come close to matching the Greens. On March 3rd, 2016, elections were held in three federal states – Baden-Wurttemberg, Rhineland-Palatinate, and Sachsen-Anhalt – in which AfG scored 15.1%, 12.6%, and 24.6% of the vote respectively. This is not to say that AfD has accumulated all of the vote of the “right of center” spectrum, however. In the Sachsen-Anhalt elections, for example, right-wing radical organizations such as the Right also participated, gaining .2% of the vote while the National Democratic Party of Germany was supported by 1.9% of voters. Compared to previous elections, the National Democrats’ loss amounted to 2.7%. Thus, the most consistent right-wing radicals who adhere to traditional political views are still not exclusively within the AfD’s support sphere. The young party has, however, been afforded formidable support from the PEGIDA movement, many of whom, in turn, had voted for the CDU, FDP, and even Left before. 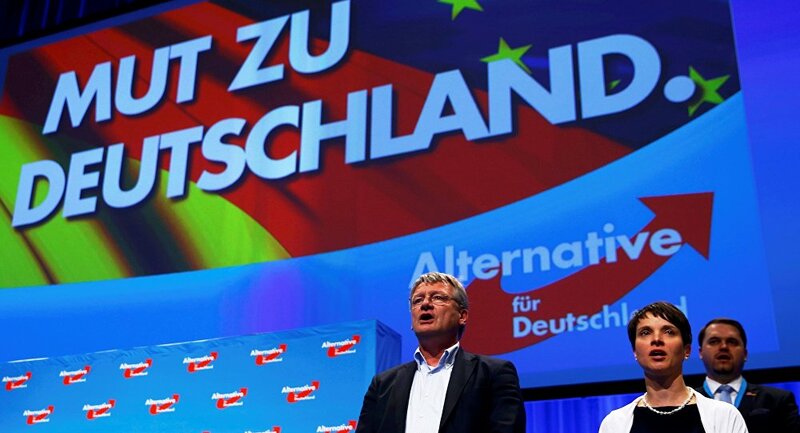 In the run up to the next elections to the Bundestag, rapprochement with PEGIDA might be a decisive step for AfD to become the “people’s party” and an influential player on the German political field. Junge Alternative. Uber uns. [Электронный ресурс] https://www.jungealternative.com/info/ueber-uns/(дата обращения:9.07.2016). Bundessatzung der Jungen Alternative fur Deutschland. S.2. [Электронный ресурс] http://storage.jungealternative.com/dokumente/2015-07-09-Konsolidierte-Statuten-der-Jungen-Alternative-f%C3%BCr-Deutschland.pdf (дата обращения:9.07.2016). Junge Alternative. Programmatik. . [Электронный ресурс] https://www.jungealternative.com/info/programmatik/ (дата обращения:9.07.2016). Buch: «Der Islam. Fakten und Argumente» [Электронный ресурс] http://unser-mitteleuropa.info/2016/06/17/buch-der-islam-fakten-und-argumente/(дата обращения:17.07.2016). «Wer der Pamphlet erwartet, wird enttauscht sein»[Электронный ресурс] http://www.mdr.de/thueringen/afd-broschuere-fakten-zum-islam-100.html (дата обращения:17.07.2016). Henkel M. Der Islam. Fakten und Argumente. S.116. [Электронный ресурс] http://afd-thl.de/wp-content/uploads/sites/20/2016/06/Der_Islam_Fakten_und_Argumente.pdf(дата обращения:17.07.2016). Alternative fur Deutschland wachst rasant[Электронный ресурс] http://www.handelsblatt.com/politik/deutschland/afd-mitglieder-alternative-fuer-deutschland-waechst-rasant/10789344.html (дата обращения:10.07.2016). Bericht: Jeder zehnte AfD-ler war fruher bei der CDUhttp://www.focus.de/politik/deutschland/abwanderung-aus-den-etablierten-parteien-bericht-jeder-zehnte-afd-ler-war-frueher-bei-der-cdu_id_5572992.html [Электронный ресурс] (дата обращения:10.07.2016). Landtagswahlen 2016[Электронный ресурс] http://www.spiegel.de/thema/landtagswahlen_2016/(дата обращения:8.07.2016). Wahl des 7. Landtages von Sachsen-Anhalt am 13. Marz 2016[Электронный ресурс]https://www.statistik.sachsen-anhalt.de/wahlen/lt16/index.html(дата обращения:8.07.2016). Flüchtlingskrise: Das Dilemma der Linken[Электронный ресурс] .URL: http://www.spiegel.de/politik/deutschland/fluechtlingskrise-das-dilemma-der-linken-a-1062306 html (дата обращения:12.07.2016).